The interactive map below shows the net migration (inflows minus outflows) of each country in the European Union between 2010 and 2015. Blue circle = positive net migration (more inflows). Red circle = negative net migration (more outflows). Each orange dot represents 1,000 people. Hover over a circle (or tap on mobile) to see that country’s total net migration between 2010 and 2015. Click a circle (or tap the bubble twice on mobile) to view only the migration flows in and out of that country. Zoom in to see the migration between countries in the E.U..
After posting a map a few days ago showing which countries in the E.U. have the most citizens living abroad, a number of people reached out with suggestions for other ways of slicing the E.U.’s immigration data: Which countries have the largest immigrant population? How fast is each country’s immigrant population growing? How do the number’s look per capita? So, following the theme of the prior post (the general need for more factual information in the immigration debate), here are a few more maps that break down each country’s immigration data in various ways. The map above shows the net migration flows in and out of the E.U. over the last five years. By selecting a country (clicking or double tapping on mobile) you can see the details of where that country’s immigrants (incoming foreigners) are coming from and where its emigrants (outgoing citizens) are going. You can also see how fast each country’s foreign-born population is growing / shrinking, which is represented by the size and color of the bubbles (blue = growing / red = shrinking). As it relates to the United Kingdom (and the Brexit), though the U.K.’s immigrant population is not the largest in the E.U. (shown further below), it is the fastest growing. Of all the countries, the one that jumps out to me as the most interesting is Spain. Its population has the same percentage of foreign-born people as the U.K.’s (13%), so at one time it was an attractive place for immigrating foreigners. Currently, it is Europe’s second biggest net exporter of people. However, more interesting than the number of people leaving Spain are the countries where those people are going: Bolivia, Ecuador, Morocco. These are not the countries you normally associate with economic opportunity, at least not compared to Europe. It goes to show the pattern does not always follow the “poor country immigrates to rich country” stereotype. 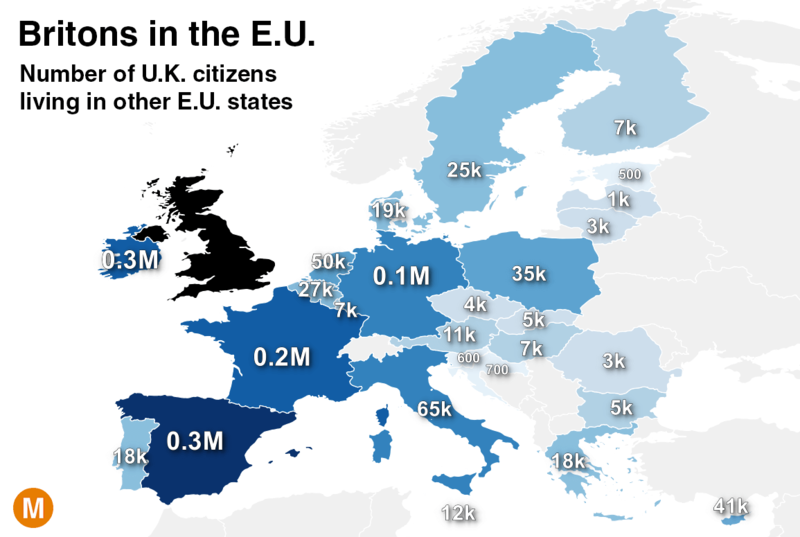 The U.K. has 4.9 million citizens living abroad, more than any other country in the E.U. 1.4 million Brits live in other E.U. countries, predominantly Spain, Ireland, France, and Germany, as shown in the map. The remaining Britons that live outside the E.U. are concentrated in four countries, all former colonies: Australia (1.2 million), the United States (700k), Canada (600k), and South Africa (300k). These are the per capita figures for the map I posted the other day. Though the U.K. has the largest population living abroad in absolute terms, on a per capita basis it is only slightly above the E.U.-wide average of 7%. This map deals with the other side of the migration equation, the percentage of each country’s population that is foreign-born. Overall, 11% of the people living the E.U. were born somewhere other than the country where they currently reside. Of those, about 60% were born outside the E.U. and 40% come from a different country within the E.U. Here are the numbers from the map above, shown in absolute terms. 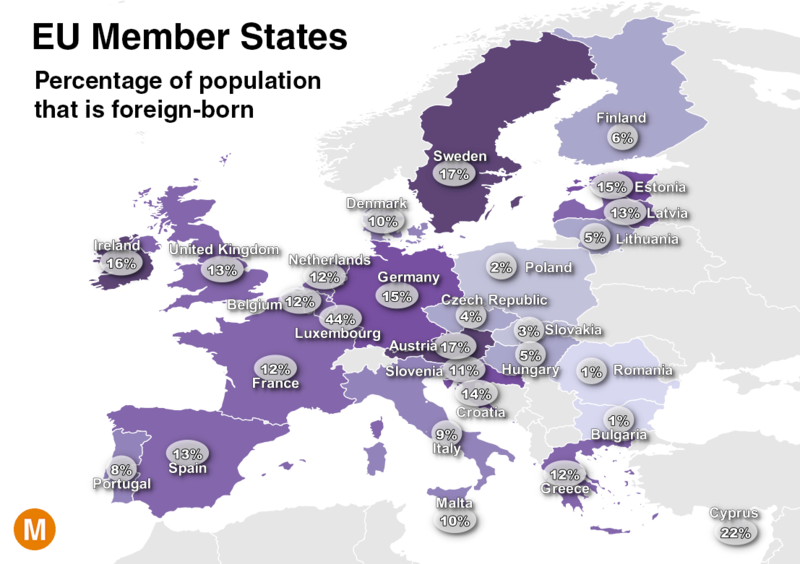 The three biggest countries (Germany, France, and the U.K.) account for about half (52%) of the E.U.’s foreign-born residents (vs. 42% of the E.U.’s overall population). 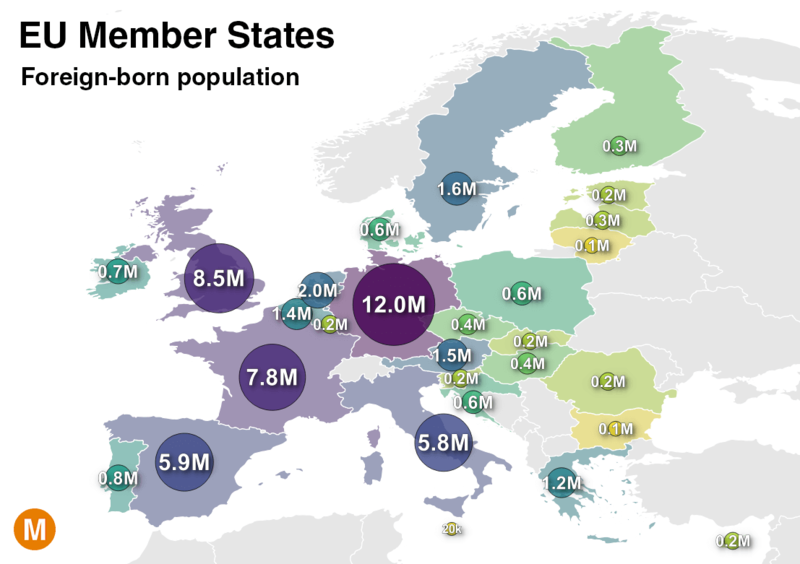 See how this map compares with the number of citizens each E.U. country has living abroad, what the difference is between “expat” and “immigrant,” and why these questions matter for so many of the world’s most important current events. All the data for these maps comes from the U.N. Population Division, also posted on the Get the Data page. See also the worldwide version of the map at the top, interactive map of the world’s migration flows, and 200 years of U.S. immigration. Previous Article Which EU Country Has the Most Citizens Living Abroad? Next Article Ever sat on a beach and wondered what’s across the ocean? It may not be what you think. Which EU Country Has the Most Citizens Living Abroad? If I remember correctly, the stay vote was also concentrated in the cities. During the housing bubble Spain received literally millions of inmigrants, and people from Ecuador, Bolivia and Morocco were the most significant. When the Spanish economy turned to bitter many of these inmigrants returned to their home country. Latam nationals can easily obtain Spanish nationality not waiving the former nationality. This is why apparently Spaniards are migrating. But they are not. Spanish born nationals are migrating, but in very modest numbers.